Below you can watch these origami flower video instructions to learn how to make this gorgeous 8-petal flower! This design is much easier to make than you may think - it looks pretty complex, but actually its quite a quick & simple origami model to make. This flower works perfectly with the origami leaf design which contains a little pocket - all you do is insert your finished flower into the pocket of the leaf and you have the perfect combination! Scroll past the video for some tips on how to fold the petals to get them looking just right- there are a couple different methods you can use - one is shown on the video, but then there is another way you can do it which is slightly different. OK, lets begin watching the origami flower video instructions! The only harder bit is shaping the petals at the end - you can leave them pointy if you wish, or you can round them out slowly by flattening and pressing them with your fingers, and the video will show you how to do this. Another option to make the petals of the flower look neat is, instead of just "rounding out" the petals as in the video, you can actually fold the very tips of the petals over backwards on themselves - just the very tips, that is the last couple of millimetres. This method would work well with only some types of paper - paper that is too brittle may just tear with this delicate folding technique. I encourage you to try different types of paper for this one - its worth a few folds to get it rights, as the end result is just beautiful! 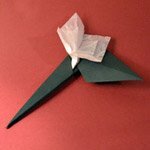 If you have made an origami flower, any sort at all, we would love to show it to other origami-fun visitors!! You can upload a pic and tell us a little about it by clicking the link below, and you can also have a look at what others have posted to Origami-Fun too! Click Here For More Origami Flower Video Instructions!